Fish & Rice Kibble is a wholesome and natural hypo-allergenic dog food for loose bowels and for calming itchy and irritated skin and coat. High in Omega 3 fatty acids, Fish & Rice provides a unique taste which dogs love whilst supplying the vital nutrients for maintaining optimum health for your dog. Added benefits come from olive oil which is high in mono-unsaturate fats and also from peas and chicory which is necessary for ease in digestion. Ingredients have been specifically designed for adult dogs. Fish meal* (20.8%), brown rice (20.5%), white rice (20.4%), barley, whole linseed, fish stock (3.8%), olive oil, peas, fish oil (2.2%), alfalfa meal, chicory pulp, seaweed (0.5%), sodium chloride, potassium chloride, chicory extract (0.1%),calcium carbonate, yucca extract (0.02%). Fish meal* (21.5%), white rice (19.5%), brown rice (19.1%), barley, olive oil, fish stock (3.8%), whole linseed, fish oil (3.4%), peas, pea protein, alfalfa meal, pea fibre, seaweed (0.5%), chicory pulp, potassium chloride, sodium chloride, parsley (0.125%), nettles (0.125%), chicory extract (0.1%),taurine (0.1%), calcium carbonate, glucosamine (0.045%), yucca extract (0.02%), chondroitin (0.005%). 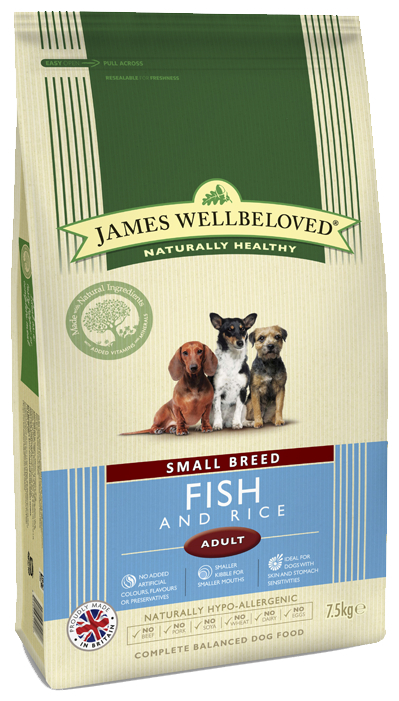 There are currently no questions for James Wellbeloved Adult Maintenance Fish & Rice Dog Food - be the first to ask one!